This blog is also available in video format on YouTube! I get several messages a week asking me what fabrics I use for my snap tabs, bookmarks, and other “stand-alone” ITH projects (felties, bookmarks, snap tabs, snap bracelets, etc) – anything you don’t have to perform extra steps after it’s finished, like turning inside out, stuffing, etc. I have experimented with different materials over the years, and what I’ve found works best for these projects is marine vinyl for the front, and a pleather-type fabric on the back. You can get marine vinyl at lots of fabric stores. At my JoAnn location, the marine vinyl is in a corner with the home dec/upholstery type fabrics. They are on lonnnnng rolls and you load up the roll into your cart and go to the cutting counter. Don’t let the price scare you! The rolls are very long, and you only need a third or half a yard to begin with these small projects. Don’t forget to use your coupon! That said, fabric stores like this may not have a big selection of colors. For more choices in color, style, and texture, I suggest shopping online. There are lots of vendors online for vinyl and craft supplies. The store I frequent is called MiKri World and they have plain marine vinyl, glitter vinyl, textured vinyl, sports vinyls, and more! Best of all, the shipping is amazing! They ship fast, and if you’ve paid too much, they will refund you the overage.. Who does that?! I highly recommend MiKri’s sampler box – this is shipped free and it’s packed to the brim with samples of all kinds of vinyls that they carry! This is an amazing way to try out all kinds of vinyl – deciding which ones you love and what colors are your favorites. I know that $100 is a chunk of money, so if you can’t afford that right now, just try out a small selection of your own choosing. For less than $10 including shipping you can get out with a few sheets just to give them a trial run. Of course you can always use regular fabric for your ITH projects. 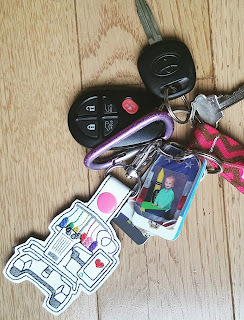 For over 6 months I toted around a mason jar key fob and the edges got very frayed, and I liked it that way! If you want a less-frayed look, you can always iron a piece of heat-n-bond-lite onto the back of your fabric before you begin; I’ve also heard of folks using Fray Check on the edges. For the back of the ITH items, I used to use felt but after carrying around a keychain on my own keys for a long time, I found I did not like the way it got fuzzy and it looked messy. So once again I dug through the remnants bin at the fabric store and I found this awesome “pleather” type fabric – it’s thin, doesn’t fray, and is slick so you could wipe it off easily if something yucky got on it. It is SO cheap so I use it to back everything now! I love the clean, professional finish. Of course, my tips are not embroidery law and I encourage you to raid the remnants bin or your own scrap drawer, and try out different materials! These should be fun projects and I hope you feel free to and even excited about creating unique projects with what you have. 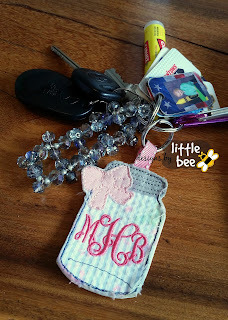 Find out more of my ITH must-haves by visiting this blog: https://www.designsbylittlebee.com/2016/08/ith-project-must-haves.html. I think I have some pleather and agree it will last better than felt.